As early as 1906, the community was visited by traveling priests who served the recently arrived Orthodox immigrants scattered around the Midwest and concentrated in growing cities like Toledo and Fort Wayne. At least twice, Grand Rapids was visited by St. Raphael Hawaweeny, who encouraged the faithful to establish a church and who ordained and trained St. Nicholas’s first pastor, Father Philipous Abu-Assaley. Father Philipous was ordained in 1908. His youngest daughter, Rosemary Sears, still faithfully attends St. Nicholas. The community purchased its first church building in 1908 and incorporated as St. George church in 1910. Grand Rapids became a center of Orthodoxy in the Midwest, as Father Philipous himself continued to travel around the region, ministering to the faithful. 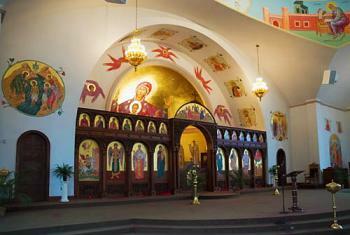 By 1923, however, Grand Rapids’ Antiochian Orthodox community found itself divided by the dispute known as the “Russy-Antaky” split, a dispute over church governance that arose in the aftermath of the repose of St. Raphael and the organizational confusion that ensued throughout American Orthodoxy in the wake of the Russian Revolution. 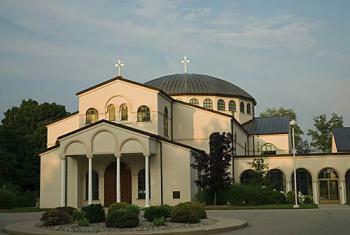 The parish’s website address is www.stnickgr.com and contains photos, contact information, and a calendar of services. Every week the church welcomes numerous visitors from the community and from local colleges, drawn to St. Nicholas by its steadfast devotion to Orthodox tradition and the beauty of its worship.